We’re creeping up on mid-September and the temperature is still tipping into the 80’s. I see relief on the horizon. With much enthusiasm, stock pot ready and wooden spoon in hand, I anticipate a fall and winter filled with homemade soups, stews and hearty meals. I’ve added a few culinary goals to my list for the season. These include Coq au Vin, a short ribs recipe and stepping away from the grill to slow roast a leg of lamb in the oven. During a visit to our local nursery, I found one, lone, absolutely brilliant rosemary bush. I’m calling it a bush and not a plant because it’s perfectly lush and huge. I couldn’t leave the store without it. It’s sanctuary is now my kitchen, where I’ve been proudly snipping it’s fragrant, grassy branches. Just wait until I get around to slow roasting that lamb. Could there be a better pair than rosemary and lamb? I think my lamb dish might be the herb-stuffed leg of lamb from this cookbook. Winner of the James Beard Book Award, Molly Stevens’ All About Braising is the quintessential cold weather cookbook. In addition to her recipes, she provides a comprehensive guide to cooking vessels best for braising, as well as a tutorial on Mastering the Art of Braising. There was lots to learn. This book is a must have for all you foodies out there. Like all my cookbook purchases, I read it from front to back before I dove in to make my first dish. Although some foods braise in the oven, an equal number are made on the stove-top. My gas range runs very hot and can be difficult to simmer. I found a small section in the book about the Utility of a Heat Diffuser, ordered one and have now solved my simmering dilemma. I highly recommend this enameled cast iron flame tamer, especially if you cook low and slow dishes. It will give you the heat control you might be missing. I made two dishes this week from Stevens’ book, Soy-Braised Chicken with Star Anise & Orange Peel and Pork Chops Braised with Hot Cherry Peppers. Both were delicious, but the unusual flavors of the chicken made it my favorite by far. I just had to share. 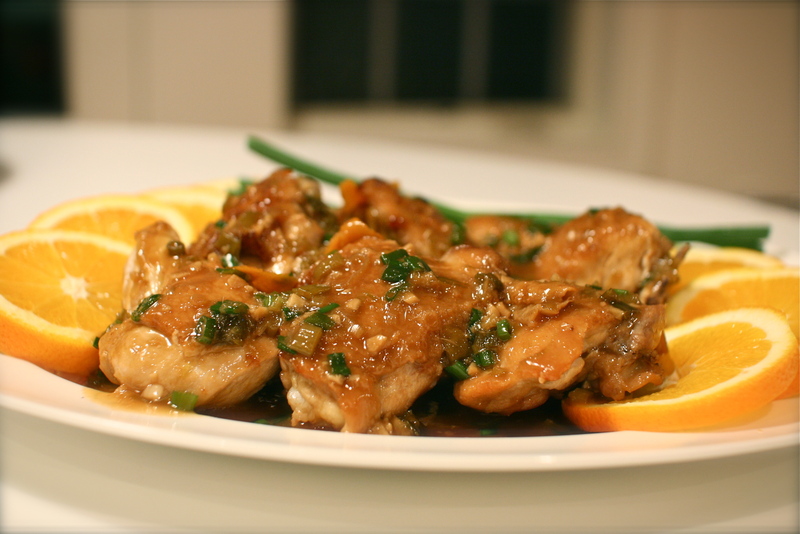 In a small bowl, combine the soy sauce, vinegar, fish sauce, sugar and 1/4 cup of chicken stock. Set aside. In a large oven-proof pot (I used a 6qt All Clad sauté pan) set on medium-high, add 2 tbsp of oil. Make sure your chicken pieces are dry to help them brown perfectly. If you’re using breasts, I recommend cutting them in half so they are similar in size to the thighs. Sear the chicken on each side for about 5-6 minutes or until golden. Be sure not to overcrowd the pan. You may need to brown the chicken in batches. Remove the browned chicken from the pan and set aside. Pour off the fat in the pan and set it to medium heat back on the stove. Add the remaining tbsp of oil and sauté the whites of the scallions, garlic, ginger and chile pepper for about 30 seconds or until fragrant. Pour in the soy sauce mixture and stir to scrape up any brown bits in the bottom of the pan. Add the orange peel and star anise. Nestle the chicken back in the pan. Pour any accumulated juices from the plate into the pot. Cover with a secure lid and place the pan in the lower third of the oven for 15 minutes. Turn the chicken over and make sure there is still about a 1/4 inch of liquid in the pan. If not, you can add some additional chicken stock. Continue cooking for another 15 minutes or until the chicken is tender and cooked through. Remove the pan from the oven, place the chicken on a platter and cover with foil to keep warm. Whisk the cornstarch with the remaining tbsp of chicken stock. Remove the star anise and chile pepper from the pan. Place the pan back on the stove set on medium-high heat. Add the scallion greens and pour in the cornstarch mixture, whisking until incorporated. The sauce will immediately thicken. 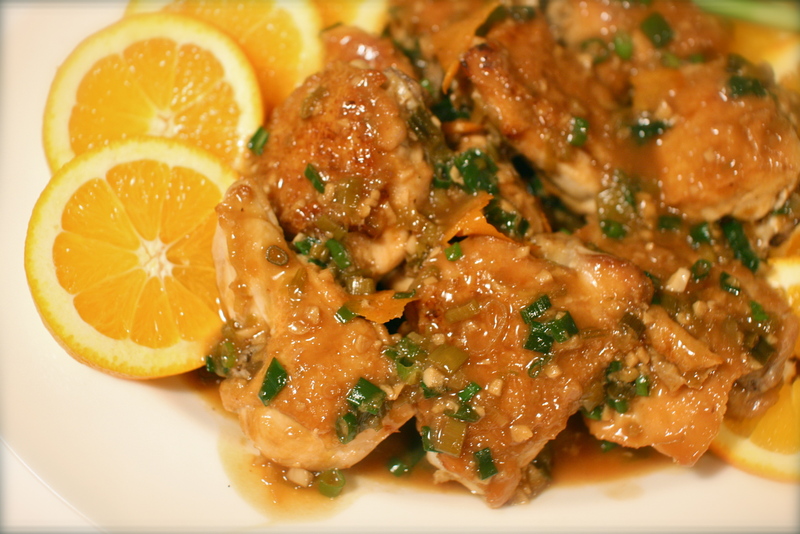 Simmer for just a minute and pour the sauce over the chicken. 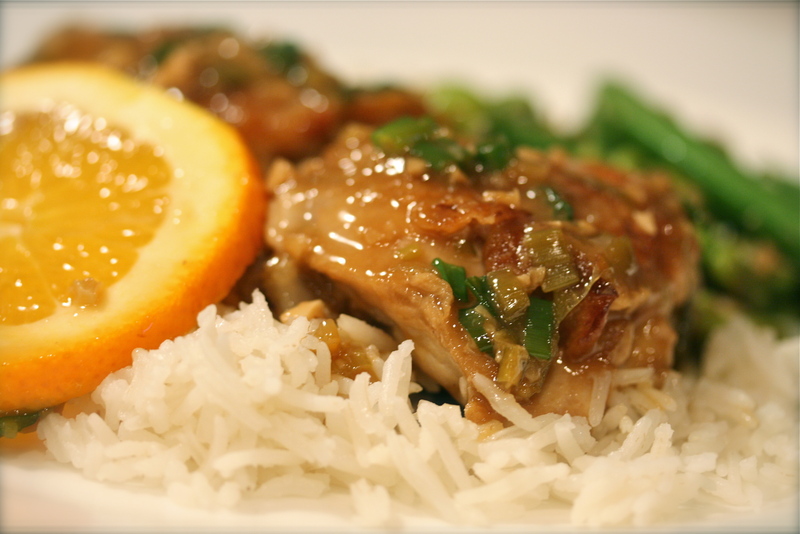 I served sliced oranges, steamed basmati rice and sautéed snap peas with shelled edamame alongside the chicken. A 5 star meal! Everyone loved it. * Just a reminder, chicken breasts will cook faster than the dark meat. You should check the breasts with a meat thermometer (165 degrees is done) and you may need to remove them from the pan before the thighs to prevent them from drying out. Just place the cooked breasts on the platter and cover with foil to keep warm. I prefer chicken thighs, but made the breasts to satisfy my husband who insists white meat is better. Should I tell him he’s wrong again? …really missing my kitchen now!!!! Soon you will be happy and cooking in your beautiful new kitchen!!!! I love braised meats and the crock pot is my best friend when cold weather hits. As much as I don’t look forward to cold weather, I do love savory, stick to your ribs meals. Interesting you mention the crock pot… I’ve been contemplating getting one, but this book has me now thinking I don’t need one. Verdict is still out for me. I can’t wait for cold weather to make all those yummy hearty meals.